Before we brought you Nvidia 780 Ti’s benchmarks, now we bring you its overclocked benches, only a few are available but believe me when i say, they do not disappoint. The source is again the credible Chiphell forums. Firs things first, the comparison is between an overclocked GTX 780 Ti with its stock self and the R9 290X. We would like to point out that unlike the R9 290X the 780 Ti’s cooler is quite sufficient for OC whereas the R9 290X is not. It might be more fair to wait for the Custom models of the R9 290X to show up before pitching in. Still the results speak for themselves. This is the in-built benchmark of the new Tomb raider. Although we do not know the resolution this is run at we can make an educated guess. The titan scores an average of 73 frames in this bench at 1920×1080 so we would be willing to bet this is on the same resolution and an average of 77.7 fps is a an okay improvement over its predecessor. 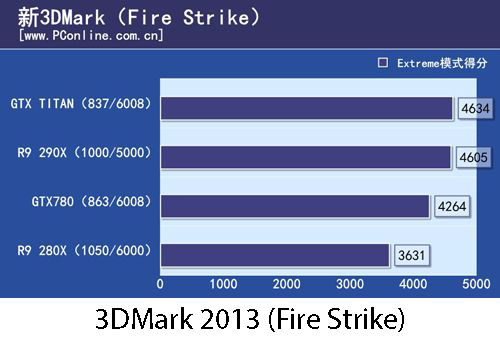 Below you can see the stock score of the GTX 780 Ti in 3dMark Firestrike. 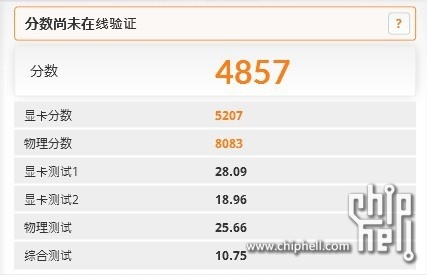 For a quick comparison: The Titan put forward 4634 points, in comparison the 780 Ti shells out 4857. While the 780ti can manage 5600 easy with overclocking and the already present gpu-boost. The 780 Ti has a huge overclocking headroom as proven by the almost 800 points lead of the overclocked 780ti over a stock 780 Ti. With Nvidia releasing the 780 Ti to exceed the AMD 290X, we think it is surely is doing the job. Maybe we are wrong but we doubt that the 290X (even with custom coolers) can manage an overclock this big, it already is a pretty hot card. But then again you never know till the problem is put to the test. Meanwhile, this should show once and for all just how much of a beast the GTX 780 Ti really is.